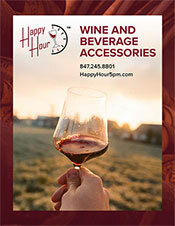 Happy Hour Inc. is a wholesaler/distributor of Wine and Beverage Accessories. We are a family owned and operated company. We sell our products to Wine Stores, Wineries, Grocery Stores, Liquor Stores, Drug Stores, Convenient Stores and Specialty and Gift Shops. The majority of our customers sell Wine, but not all. Our Wine Clutches are flying off the shelves! Our other top selling items are High Heel and Hand Bag Bottle Stoppers, WineSkins, Wood Plaques, Shark Skins, Haley’s Corkers, Wine Hook, cork cages, wine glasses, wine games, corkscrews and bags. Many of the bags we sell are custom embroidered with the customers’ names and logos. Happy Hour also offers several other items which can be personalized. Happy Hour is a distributor of several key wine accessory products. Many companies have 1 great item that they sell. It is often hard for a 1 item company to get full market penetration. By representing several of these types of companies, we are able to offer our customers a complete line of the best accessories on the market today. All Major Credit Cards are accepted. Net 30 day terms are available, based on credit approval. For convenience, Happy Hour does accept PayPal. Custom printing or logo orders require a 50% deposit. Shipments are FOB our warehouse in Antioch, IL. Unless a specific shipping company is designated by the customer, Happy Hour will ship the fastest and least expensive method possible, selected at the discretion of Happy Hour. If we prepay the freight, our discounted cost will be added to the invoice. All case packs are UPS or FedEx approved carton sizes. Since many of the case packs are small, Happy Hour will combine case packs into larger boxes to save on shipping. There is a $150 initial order minimum for Happy Hour. There is no minimum on ensuing orders, only that full case packs are purchased. Also, no handling charges are added on our shipments. To establish credit, please send 3 current trade references and a bank reference along with your billing and shipping addresses. Please include your Federal ID number (EIN) or reseller number. Or ask us to supply a Happy Hour Credit Application form. All Happy Hour, Inc. products are warranted from manufacturer’s defects for one year from the date of purchase. Contact Happy Hour for any defective claim. To improve quality and value, we may occasionally make enhancements or modifications to our products. As a result, features or pictures in this catalog may have minor differences from the products we ship.